Price: $10 pre-registry, $15 at the door; ages 12 and under get in free. 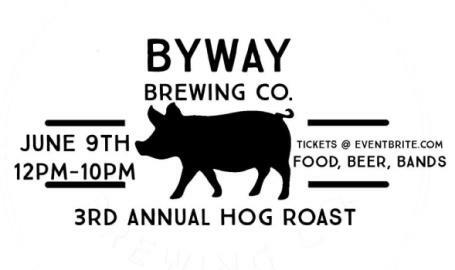 Join Byway for their 3rd annual hog roast. For the second year, DOC'S BBQ is generously donating their smoker and pitmaster expertise to do the hogs while Byway will be adding roasting lambs to the party as well! They will have $3 select beers available and also a newly released beer this day, too. Included in ticket: entry, 1 drink ticket, and a donation towards the Hammond Police & Fire Departments.